I find it difficult to love a book when I find myself disliking the characters more and more as the story progresses. This story starts with a simple mismatched romance between working class Luke and his wealthy girlfriend Zara. And slowly, as characters are added and poor decisions seem to multiply, we see the absolute worst of each character. I enjoyed the chemistry between Luke and Theo but I hated the exaggerated class divide and Giles’ snobbery. I really never understood the reasons for Giles’ aggressive behaviour and I really didn’t understand how Theo and Zara allowed it in their home. Adding cheating and secrets and lies just made these characters more difficult to like. I felt the ending exploded and then fizzled before limping to a rather unsatisfying conclusion – it just didn’t work for me. As this descended into angst and drama, I struggled to finish it. I am awarding three stars because this is a young adult story and fans of Hollyoaks and other teen soaps will probably enjoy this much more than I did. This was a great read about the hardships that some young adults may go through when they realize what their sexuality is. Luke is 17 and has a girlfriend that he is content with, Zara. 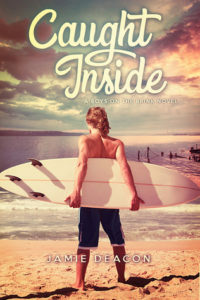 For summer break Zara invites Luke to join her and her cousin at her parents beach cottage for he summer. Luke is all for the surfing and spending some time with Zara. Just like any good book there is a twist. When Luke meets Theo, feelings he has try to banish from his mind start to arise. As hard as he tries to deny he is attracted to Theo, he no longer can when Theo kisses him. From that moment on Luke knows that he can no longer deny his attraction and he no longer wants to try too. Luke and Theo come to the understanding that they will keep things under raps for a while but it keeps getting harder and harder to hide the truth. Especially since Zara really wants to make things work with Luke and Luke really wants things in the open about him and Theo. Things finally come to a crashing hault and everyone is hurt in the mix. This book was a great read. It is the perfect example of the struggles that some may face when they come to the realization that they can no longer deny who they are. It is also the perfect example of how some people may be caught in the cross fire and end up hurt. I think that Jamie Deacon did an amazing job with this book and did all the characters justice by making the book so close to reality.